Mill Creek Adult Religious Exploration exists to awaken us to the power of love by facilitating opportunities for people to encourage one another throughout their ongoing process of spiritual growth. 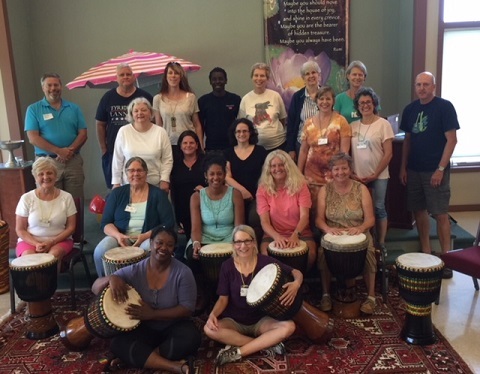 Participants in the djembe class led by Senegalese artist, Pape Demba “Paco” Samb. Led by a dedicated team of volunteers and instructors, our Adult RE program engages participants in experiences and opportunities for spiritual growth and development. It’s a great place to meet people with similar interests and make new friends! CLICK HERE to check out opportunities for Adult Learning at Mill Creek.